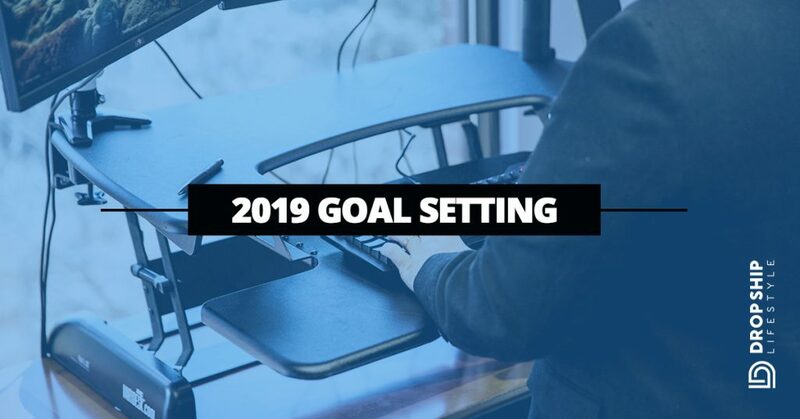 It’s time to take a different approach to goal setting... One where you actually look into the future to make sure your 2019 takes you where you want to go for the long term. Whether you’re 16 or 60 it’s so easy to get caught up with all the little things in life. With the New Year just behind us, everyone has been making and sharing their New Year’s resolutions and 2019 goals. And while I love the intention of that, and the message is 100% right, there are still things you could do to have a better year than the last. However, I think a lot of people are thinking too short term when they do this. That’s why I decided to put together this blog post. I want to make sure that the things you’re doing as you set your 2019 goals are goals that will also set you up for your ideal lifestyle. (It is called Drop Ship Lifestyle for a reason, you know?). So here’s my approach for annual, long term goal setting and how you can copy it! This blog post is also available in video form. Click ‘Play’ below to start watching! Make sure to subscribe to our YouTube Channel for weekly updates and insights from Anton! It’s good to look at the big picture. That’s why I set my goals for 20 years from now. And then I work backwards. In fact, I just ​started setting these long term goals. Two years ago, if you would have asked me where I would be in 20 years… Well I’d tell you that I have no idea. I wasn’t the long term thinker back then. Like most people, I was always ​most often in the mindset, “What am I going to do today? What goals am I going to hit this month?” All sorts of short-term thinking like that. I think the reason why (for me, personally) I've always been like that is because up until a few years ago, I wasn't married, I was really never in serious relationships. And I definitely didn't have a kid. Now I have a baby, and that kind of forced my mind into this more longer-term thinking. ​​Someone’s Sitting in the Shade Today Because Someone Planted a Tree a Long Time Ago. Honestly though, now that I'm thinking more about the big picture these days, I do realize I could've and should’ve done it before I got married and had a kid. Again, no matter where you are in life, I think setting long term goals is definitely relevant. Trust me, whatever success means to you, ​goal setting is only going to set you up for more of it in the future. How I set long term goals for myself was by looking at three main categories: finance, real estate, and relationships. To clarify, to me, real estate really just means locations and where I would like to be. These categories might change for you, but I think these are three big pillars that apply commonly to most people in their goal planning. Let’s start with finance and setting goals for your future net worth– What do you hope your net worth is 20 years from now? Remember: ​net worth is the combined total of all assets minus liabilities. Don’t make up a number out of anywhere. Make it something that’s actually relevant towards what you want out of life. It’ll make the goal setting process work a lot easier if you’re realistic. 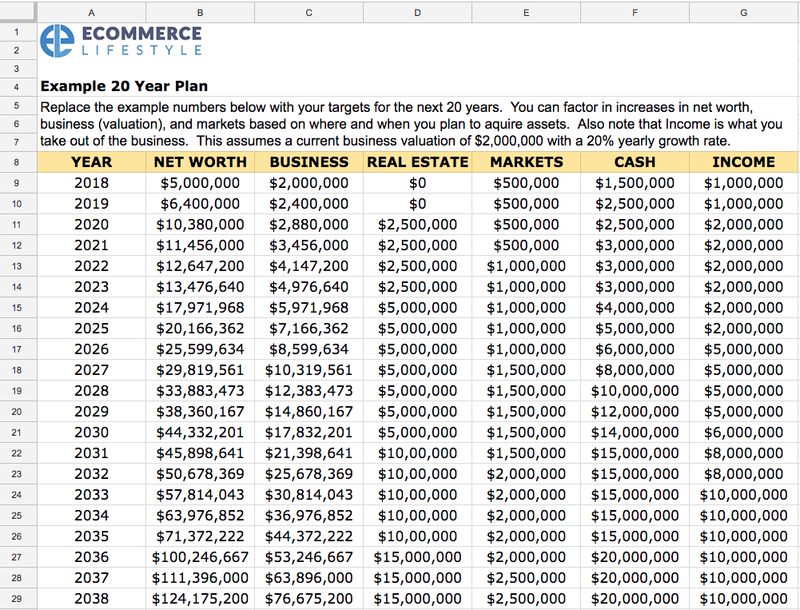 After writing down your net worth, write down what you want your annual income to be at 20 years down the road. This is money that could be made from different business investments. This could be made from different stock, real estate, and even different businesses that you own. Finally, the next thing you need to consider is how much liquid cash and savings do you want to have in the future. So again, these are things I recommend you do for yourself when you start setting long term goals, and you know what? You should be thinking big here. ​Don't make up numbers just to make them up, but this is 20 years from now– THINK BIG! And there's one quote that I've heard forever online, and it's that us, as humans, grossly overestimate how much we could accomplish in a short amount of time. On the other hand, we also grossly underestimate what we could do over the long term. So again, 20 years is a long time. However, if you're making progress 365 days a year, for 20 years, then yes, you could set some pretty aggressive targets for yourself. And it'll also help you with your thinking, which we'll get to in a little bit. Write down where you hope to be, number-wise, with your assets, annual income, and liquid cash. Don’t make up numbers, but do think big for long term goals! Remember, we grossly underestimate what we could do over the long term. Next is real estate. Now at this point, I’ve never personally owned real estate in my life. I rent because I move around a lot. But 20 years from now, I do want to settle down with some real estate. In 20 years, my goal is to own two different properties. My primary residence is going to be a New York City penthouse in Central Park. So I have that on my list. I'm not going to buy it now here in 2019 though. I'm not gonna buy it in five years. I'm not gonna buy it in 10 years. But maybe in 15 years, or so. We'll see. Either way, I'll have that NYC penthouse in 20 years and I’m setting goals now that will help me get there. I also want a place I could spend different seasons at, and a place family can come and visit, a place I could meet with friends and business associates. Which is what I want my second home to be. This one is more of just like a lifestyle thing, but I want that to be a villa in Italy. And now, boom, that's on my list of goals. No matter what you’re at now, consider where you want to be living in the future. If you’ve got a big dream, setting long term goals will make getting there a reality. ​A Goal Properly Set is Halfway Reached. Finally, is my list of long term goals for my relationships. For you this could be marriage, single, number of kids, amount of time for family and friends, etc.. All of that goes in the column for relationship goals. Now I mention this section should also be where you write down your goals for time freedom. Some people build businesses that require them to work 80 hours a week. But those businesses provide them with their income goals and the penthouse they really want. Do you want to build yourself into something where you are just a ‘Gary Vee-style’ worker? Always on the road and on planes with not much family time as you grow your business? Is that what you want in the future? If so, go for it! Think of what you want for time freedom in the future. Whatever it is, make sure to the choices you make will lead you there in the future. Are your income goals aligned with your relationship goals? Again, this is a brief overview of how I set my long term goals. Here are some templates of the same spreadsheets I use to help me with goal setting. Use these for yourself and setting your future self up with big dreams. Setting long term goals is a good strategy to help you reach your big dreams. ​Setting Goals is the First Step in Turning the Invisible into the Visible. Now, what I'll say is, if you're watching this, and you're brand-new and have never built a business before, this still is important. I will say when you're first getting up and running, do what you have to do to start building a bankroll. Goal setting for the long term works a lot better. At least it did for me, once I had some cash in the bank and bit of a safety net so I could focus on the bigger swings. Well, guess what? You still have 15 more years. If you're making progress, it's going to compound, it's going to help you hit your goals. If you don't do this right now, if you don't set any goals for the long term, if you just continue to live your life day-by-day, and year-by-year, then guess what? In 20 years, who know where you'll be? At least this goal setting method gives you a framework. It gives you a target. It gives you something to kind of frame every action you take towards getting there. Once you set your long term goals, give this a listen. It’s an episode I recorded recently for my eCommerce Lifestyle podcast. In it, I share tips and strategies that will help you make better decisions and eliminating the distractions keeping you from your goals. So that being said, guys, hope you found this useful for setting long term goals! If you know anybody that would benefit from this, please do share it with them. This is very informative, but I didn’t get the pdf download! Are you referring to the 237 Niche PDF? If yes, you can get it by registering for my next webinar! Hi Anton I stayed for the entire webinar and did not get the 36 page document you promised would be available for free. How do I get it? Yes you can send it to me. I just want to get started with building my store and I already have a niche. Does your company do all the stores for me and get me going turn key? Hi Philip, we do offer Done-For-You stores. They are included with our Ultimate Package. Do suppliers work *only* with those selers who have an official company? If I have no company at the moment, for the next, say, 1-3 months, should I approach and apply to suppliers at all? Anton, yes. But that’s assuming I’m a US citizen. Or I’m working with the US suppliers. Which isn’t the case for both. to see the next available time. Hi Anton Kraly, I live in South Africa.my finances so bad right now.I would like to get the full drop ship lifestyle course and make a commitment to pay you as i start earning.We could customise the store to have a debit order that pays for the course even if I earn nothing at the beginning but just pay you.Please Anton I need help. My advice to you is to start with my free content (including my webinar) and then, when you start making sales, you can invest your profits into my premium programs and take your store to the next level. Hi Philemon. Where are you in SA? I am too, maybe we can bounce ideas off each other and at least get started. Anton has excellent free videos, that we could start with. Do you need a business loan to get started? Not at all! It’s actually very affordable to get started with eCommerce when you’re drop shipping. Check out this article I wrote called: How much does it cost to drop ship? Love this line! “If you’re making progress, it’s going to compound, it’s going to help you hit your goals. ” Something good to think about this year and into the future. Thanks Anton! A proper and great way to start the 2019!